Anonymous. Embracing Obscurity: Becoming Nothing in Light of God’s Everything. Nashville, TN: B&H Publishing, 2012. 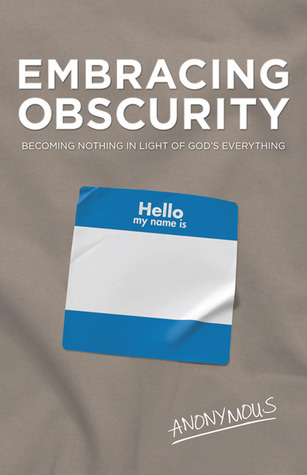 Today, a new book comes out titled Embracing Obscurity: Becoming Nothing in Light of God’s Everything. The author? Anonymous. No, that’s not his name. Writing a book on humility and self-forgetfulness, the author wanted to remain nameless. He writes, “I couldn’t think of any way to reconcile that message while simultaneously promoting myself” (back cover). The book is a simple, spirited wake-up call for Christians to embrace what Christianity is all about: exalting Christ and dying to self. In the words of the author, obscurity is all about “being content with being ‘relatively unknown’ so that Christ can be made more known. Temporarily going hungry so that many more may be filled” (13). In a way, this book is nothing new. To be honest, it is certainly not spectacular or mind-blowing. Indeed, there was not one thing in the book that I had never heard before. But that’s exactly why this book is needed. Throughout the ages, preachers and authors alike have reiterated the old story in fresh ways. The great truths and implications of the gospel are not new; indeed, they are very ancient. This book follows in that same spirit. Though simple and straightforward, it is rich in gospel reminders of what a Christian’s new identity means. In light of God’s holiness and the massive, earth-shattering realities of the gospel, we are but nothing. Yet at the same time, we are infinitely and supremely valued and loved by God because of Christ. This should motivate us to kill self-seeking, self-promotion, or self-aggrandizing, and cultivate radical, Christ-exalting worship as a way of life. That’s what this book is about. I heartily commend this book to you. I pray it challenges you and leads you to repentance and faith in Jesus Christ, who “made himself nothing, taking the form of a servant…and humbled himself by becoming obedient to the point of death, even death on a cross” (Phil. 2:6-7). Previous Post What in the World is Going on in 1 Timothy 2?! Next Post Where Did the Phrase, “Preach the Gospel to Yourself,” Come Frome?